Birthday Wishes for Nephew: If you want to be the coolest aunt or uncle around, you’ll have to do much more than just give those lame high fives. Use your nephew’s birthday as an opportunity to charm him with gifts and greetings. Pick out the best birthday card and write a quote that he can relate to. Top it off with a sweet tweet or a cute post on Facebook. From being adorable toddlers to annoying teenagers, nephews are a funny bunch. Remember that if you want to connect with your nephew on a deeper level, you’ll have to step away from your image as an uncle or an aunt. Be a friend to him – a friend who can conveniently play a parent’s role at the same time. 1) I have tried but failed, I don’t know what to do. I just can’t stop pampering an adorable nephew like you. Happy birthday. 2) If everyone in the world had an awesome nephew like you, no one would ever bother having kids of their own. Happy birthday. 3) No matter what your parents tell you, think of your uncle whenever you feel like doing something you’re not supposed to. Happy birthday. 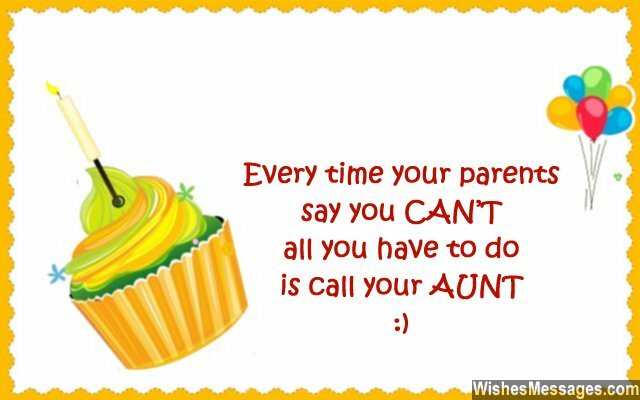 4) Next time your parents scold you, just say ‘Back off or I’ll call my aunt’. Happy birthday. 5) Our relationship is unique – you are the son I get to dote on without being a boring parent and I am the parent you get to lean on without worrying about showing responsibility. Happy birthday. 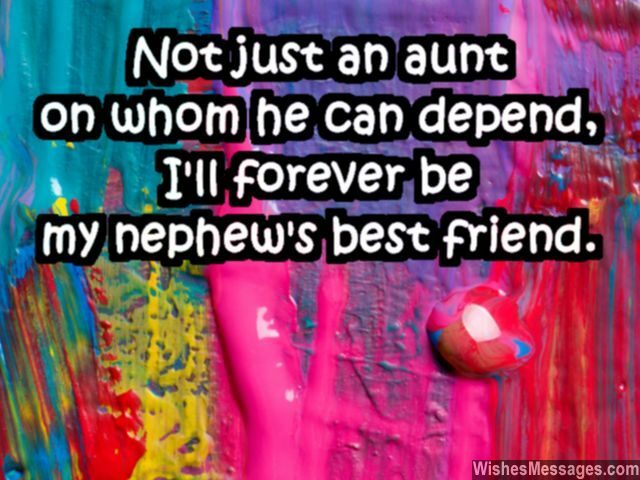 6) Not just an aunt on whom you can depend, I will forever remain your best friend. Happy birthday. 7) No wonder your parents hate me, after all I do everything to spoil you fully. Happy birthday. 8) Do you know why UNCLE rhymes with SPECIAL? Because being an uncle is really special with a nephew like you around. Happy birthday. 9) You are like my own child without nine torturous months of pregnancy and excruciating labor pains. Happy birthday. 10) Playing the moderator’s role during your fights with your parents is very easy – all I have to do is take your side. Happy birthday. 11) One of the best things in life that I get to do, is to love, pamper and fuss over my nephew. Happy birthday. 12) Happy birthday to my baby nephew. You have the power to make my day with a simple boo-boo. 13) Before you were born, I was just another ordinary man. But after your birth, I was elevated to the status of being an amazing uncle. Happy birthday. 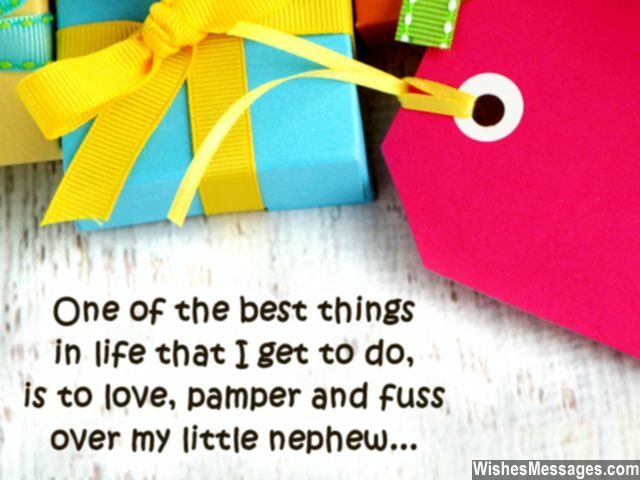 14) My birthday gift for you is the title of best nephew in the world. I hope your party favor will be to give me the title of the best aunt in the world. Happy birthday. 15) As you grow older, you’ll let go of your mischievous days and innocent ways. But please don’t let go of your cuteness, which gives me nothing but happiness. Happy birthday. 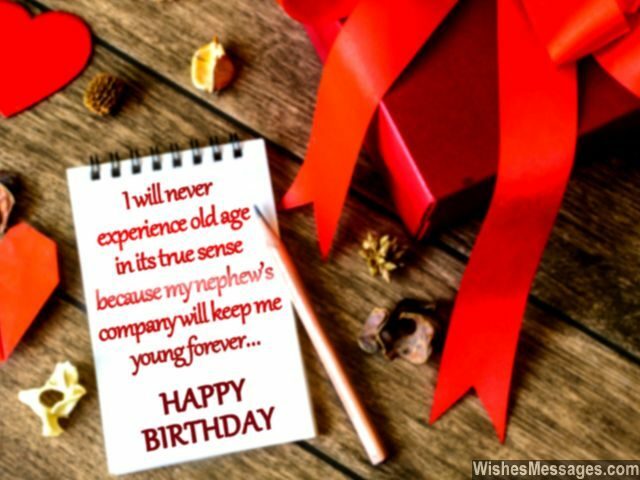 16) I will never experience old age in its true sense because my nephew’s company will keep me young forever. Happy birthday. 17) Our relationship is not limited to just being aunt and nephew. There will always be a permanent bond of friendship between me and you. Happy birthday. 18) The biggest problem of having a nephew like you is that everyone else in the family becomes too boring to spend time with. Happy birthday. 19) As long as you help me with mowing the lawn, I’ll help you with getting out of being grounded. Happy birthday. 20) My Facebook looks less like mine and more like yours, because it has fewer pictures of me than you. Happy birthday. 21) You are less like a nephew and more like a son. You have conquered every corner of my heart, you little one. Happy birthday. 22) All my best friends are jealous because now I have a new best friend who is more fun to hang out with. 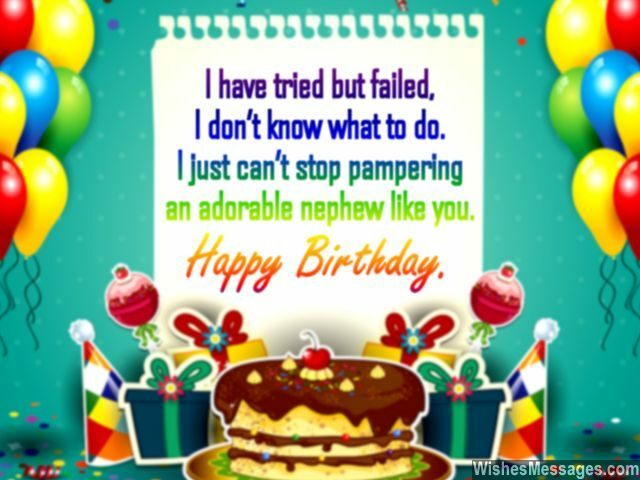 Happy birthday to my dearest nephew. 23) You may be a best bud to your friends and a good son to your parents but you beat all these things with the way you are a terrific nephew to your aunt. Happy birthday. 24) I always thought that being called uncle would make me feel old, but now I know how that feeling is worth its weight in gold. Happy birthday. 25) Your parents have done many amazing things in their lives. But the best thing they did was to give me an awesome nephew like you. Happy birthday. 26) Every time your parents say you CAN’T, all you have to do is call your AUNT. Happy birthday. 27) I love you as much as you’d love the Wii, PlayStation, iPad, Xbox and iPhone all put together. Happy birthday. 28) I would never know the real meanings of the words mischief, fun, tantrums, excitement and adventure without having a nephew like you. Happy birthday. 29) Whenever I have a son of my own, I want him to be exactly like you. Happy birthday. 30) I hope you become famous, wealthy and successful. Then I will become the lucky uncle of a famous nephew. Happy birthday. 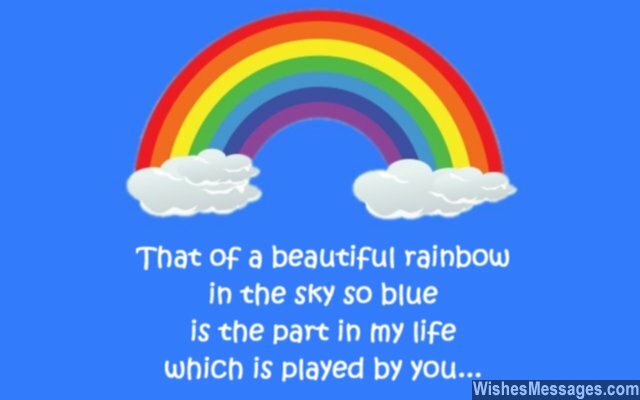 31) That of a beautiful rainbow in the sky so blue, is the part in my life which is played by you. Happy birthday. 32) If there was one nephew like you in every family in the world, the concept of dysfunctional families would never exist… because little bundles of joy make family ties stronger than ever. Happy birthday. 33) Good-looking, handsome, smart, suave and talented – you’ve taken after your uncle in every way. Happy birthday. 34) I was a strong woman until you came into my life. Now I have a new weakness – YOU. Happy birthday. 35) Nephews like you come into this world in limited stock. I was lucky enough to bag you. Happy birthday. 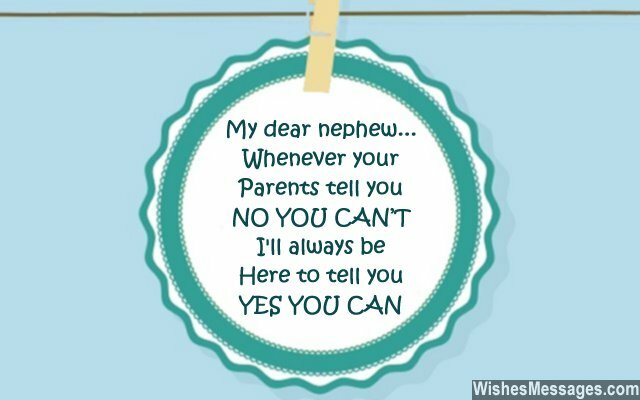 36) My dear nephew, whenever you parents tell you NO YOU CAN’T, I will always be here to say YES YOU CAN. Happy birthday. 37) I love my sister to death – only because she gave me an amazing nephew like you. Happy birthday. 38) A bit of success and a chunk of happiness. A slice of joy along with tons of moments to enjoy. I hope that as your uncle, I can make your life truly special. Happy birthday. 39) You are a delight to watch, pure bliss to experience and joy to behold. 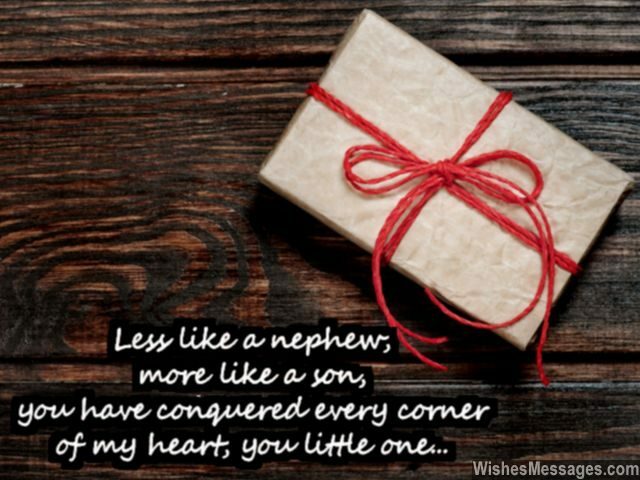 You are not just my nephew, you are like a piece of gold. Happy birthday. 40) Being a perfect uncle is really easy, when there are amazing nephews like you in the family.